Lamina specialise in the extrusion of the melt processable fluoropolymer materials, such as FEP, ETFE and PFA, using special high specification extruders and tooling which is designed in house and mainly fabricated in our own tool room. Lamina produces fluoropolymer tubing products for the electrical, medical, oil and gas and mechanical industries. Our bore sizes range is from 0.125mm to 16.0mm. We excel at producing innovative and close tolerance products to meet special applications. 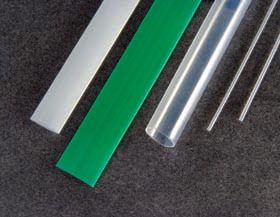 Products may be supplied on continuous reel or cut to length in both tube and layflat sleeve form.